When the message “KEYCARD BATTERY LOW” appears on the instrument panel, replace the RENAULT card battery, press button 1 pulling on emergency key 2, then unclip the cover 3 using tab 4. 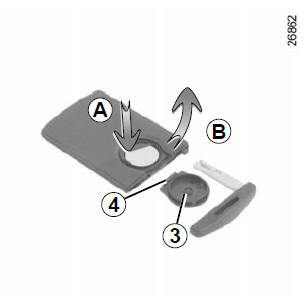 Remove the battery by pressing on one side (movement A) and by lifting the other (movement B) then replace it, ensuring the polarity and model, shown on cover 3 are respected. When refitting, proceed in the reverse order, then press one of the buttons on the card four times, close to the vehicle: the next time the vehicle is started, the message will disappear. Note: it is not advisable to touch the electronic circuit or contacts on the RENAULT card when replacing the battery. Check that the cover is clipped shut. The batteries are available from approved Dealers, and their service life approximately two years. Check that there is no dye on the battery: risk of an incorrect electrical contact. 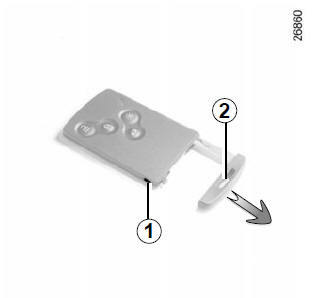 If the battery is too weak to ensure correct operation, you may start (insert the RENAULT card in the card reader) and lock/unlock the vehicle (refer to the information on “Locking/unlocking the doors” in Section 1). Do not throw away your used batteries; give them to an organisation responsible for collecting and recycling batteries.